OK so this is technically closed, but if anyone has any more questions feel free to ask and I will get to them! Hello O'Deck! First, thanks to DrillPress to putting these together. Second, sorry if this pops up late…kinja. I, Nara, am here as your resident professional pyro to answer all your questions about fire performance! You know how when you were a kid, your parents told you not to play with fire? Yeah, mine never told me that. 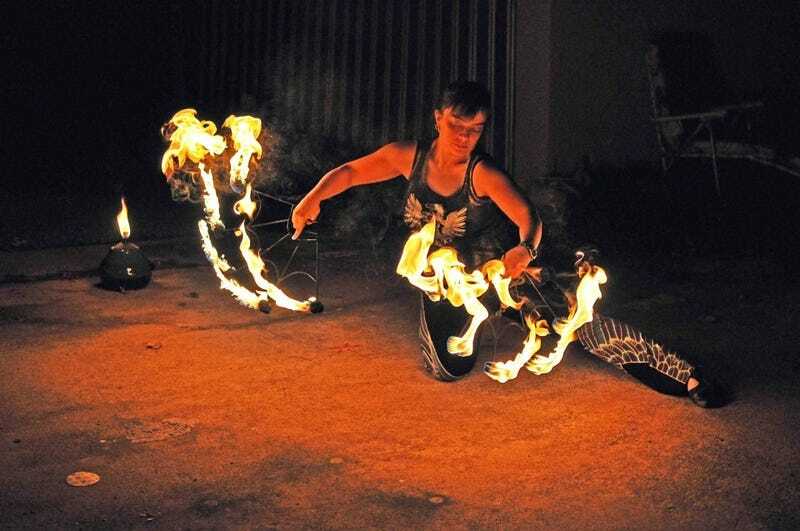 We've all seen fire dancers and some of us think, "Well that's kinda cool." Others think, "Wow, those people are crazy." And a select few of us think "I WANNA DO THAT TOO!" I'm one of those. I've been a belly dancer in a troupe for about 10 years, and a fire dancer for about 5. (And a paralegal to support my dance habit.) I do staff, poi, hoop, fans, baton, and fire eating. I love what I do and I love that I can get paid to play with fire. Ask me anything you are curious about. Want to know about tools of the trade, fuel, or if I'm just plain crazy? It might take me a bit to get to your questions today, so I will go ahead and leave this one open for a while, let's say at least until midnight Pacific time. Just be patient with me and I promise I will get to everyone.